Beginning on Thursday, October 11th, providers and staff from the hospital and throughout the CHN will have a forum to help us maintain compassion in our work by taking care of ourselves. 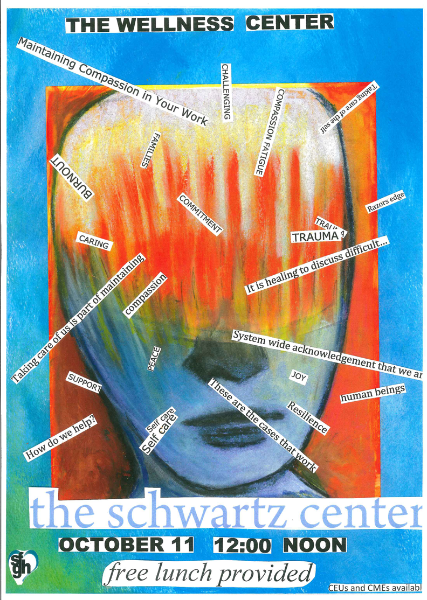 The Schwartz Center Rounds, now taking place at more than 250 healthcare facilities in 36 states, offers a regularly scheduled time during our fast-paced work lives to openly and honestly discuss social and emotional issues that arise in caring for patients. In contrast to traditional medical (grand) rounds, the focus is on the human dimension of medicine. Caregivers have an opportunity to share their experiences and feelings on thought-provoking topics drawn from actual patient cases. The premise is that caregivers are better able to make personal connections with patients and colleagues when they have greater insight into their own responses and feelings. A hallmark of the program is interdisciplinary dialogue. Panelists from diverse disciplines participate in the Rounds, including physicians, nurses, social workers, psychologists, chaplains, medical interpreters, and others. After listening to a panel’s brief presentation on an identified case or topic, caregivers in the audience are invited to share their own perspectives on the case and broader related issues. Does stopping treatment mean giving up? When/Where: The Schwartz Center Rounds are held on the 2nd Thursday of every month at noon in the hospital’s Community Wellness Center beginning October 11th. Lunch, CEU’s and CME’s provided free of charge. Join us as we take better care of ourselves and share greater compassion! For more information please contact Blue Walcer at 206-5901 (email Blue.Walcer@sfdph.org) or visit us at the Community Wellness Center.